Statesman and community stalwart Marvie Elton Georges, OBE CMG was given a fitting farewell on 21 April at his funeral service held at the Sea Cows Bay Methodist Church. Prior to the funeral service Mr. Georges laid in State on 19 April. In a moving service that recalled his dedication to public service and his love for the Virgin Islands, the community expressed a sad farewell to former Deputy Governor Elton Georges. The late Elton Georges departed this life on 4 April at Peebles Hospital, Road Town, after a brief illness. He was born in Huntums Ghut, Tortola on 1 May 1943 to Edith Georges. He was the second child. Elton attended the St. Mary’s Church School until the age of 11 when he returned to Tortola to attend Virgin Islands Secondary School. Skipping the first form, four years later in 1959 he graduated, obtaining the first Grade 1 Senior Cambridge Certificate in the history of the school. Elton then spent two years in sixth form, teaching Introductory Spanish. (Future wife Rita, was in his second form class. He is remembered as a scholar who accepted a full Canadian Commonwealth Scholarship to the Mount Allison University in Sackville, New Brunswick, in 1961. At Mount Allison he studied German and Spanish and nurtured a love for music and the classics. It was noted that Elton remained in Canada for the next few years. It was in 1964 that he returned to the BVI as the first Virgin Islander and product of the Territory’s Secondary School to return with a Degree. This was a historical feat. Upon his return Mr. Georges took up teaching at the Virgin Islands Secondary School as a graduate teacher in 1965. His stint featured him as the Head of the Mathematics Department and Assistant Principal. His teaching career was interrupted by his decision in 1969 to complete a Post Graduate Diploma in Education at the University of the West Indies, Jamaica. He continued to teach until 1971. From the classroom to the public service in May 1971 Elton Georges made the transition when he became Administrative Secretary in the Chief Minister’s Office. In 1974 he went to Canada to pursue a post graduate diploma in Public Administration at Carlton University. 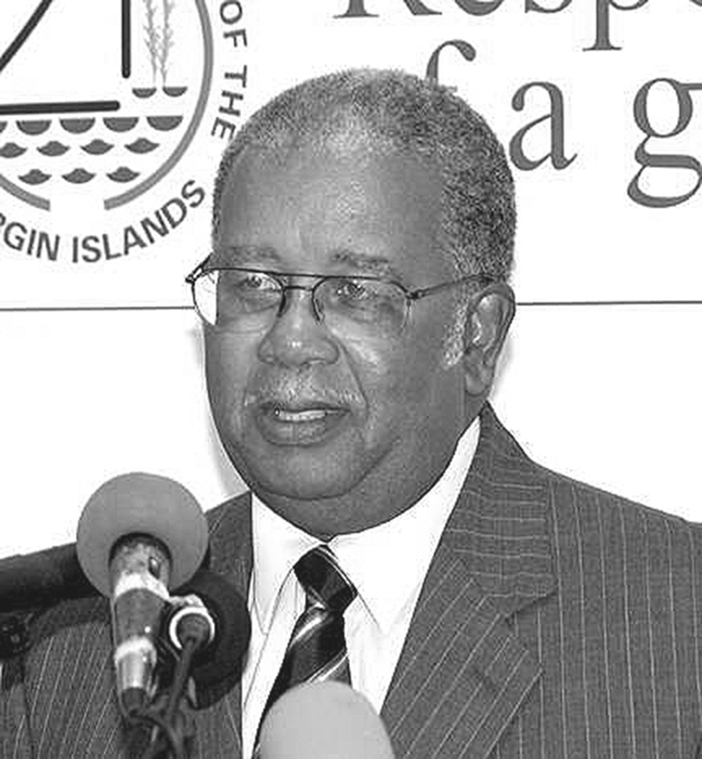 He served as Permanent Secretary and worked with the late Willard Wheatley – Chief Minister from 1971 to 1979. In 1979, Mr. Georges worked in the private sector as the Branch Manager for First Pennslyvania Bank, now Banco Popular. However, it was said that Elton’s stint in the private sector, was short as he was lured back to the Public Service in 1981, by the persistent invitations and efforts of the late H. L. Stoutt, when he became Chief Minister for the second time 1979-83. Mr. Georges served as Permanent Secretary. One of the milestones in that post is his involvement in the negotiations of the Double Taxation Treaty in Washington D. C. which was one of the developments that, later on in 1984, motivated the establishment of the Financial Services Sector. His stint as Permanent Secretary to the Chief Minister lasted until July 1983, when he was appointed Deputy Governor. The first duty he performed was to act as Governor for a period of three months, whilst the late David Barwick (Governor 1982-86) went on long leave. Over his twenty-one years as Deputy Governor, Mr. Georges performed the role of Acting Governor quite often. He worked with and deputized for six Governors, and performed the duties of his substantive post, with interest unwavering commitment, purpose, integrity, and skill. From February 2009 – 2015 Mr. Georges served as the first Complaints Commissioner or Ombudsman for the Virgin Islands — a role he held and performed with pride, bringing assistance to a number of persons in the community. He served as Director for Seven Seas Water Corporation – Aqua Venture Water (BVI) from 2015 until he passed away. In private life, Mr. Georges was a lifelong member of the Methodist Church at Road Town (where he was a lay preacher) and an active member and past president of the Rotary Club of Tortola and of the BVI Chess Federation. He was a past chairman of the HIV/AIDS Foundation (BVI), past president of the BVI Diabetes Association, avid member of the BVI Saturday Walkers, and a founding member of the BVI Alzheimer’s Association. Mr. Georges who was 74-years-old when he died is survived by his wife Rita Frett-Georges, and children Noni and Kamau Georges. He is also survived by: Daughter-In-Law -Judy Georges, Granddaughter — Eden Georges; Grandson — Tiger Williams; Sisters — O. Bianca deCastro (New Jersey), Eldra E. Taylor (Spain), Rita M. Abbott (New York), Myrtle E. Flax (Georgia), and Linnell M. Abbott (Tortola); Cousins — the children of the late James Georges; Irvin Georges; Eulalie Sewer; Hilda Todman; Gladys Davis; Special Relatives — Cheryl Flax, Patricia Vanterpool-Johnson, Janiece Flax, Grecia Dore, Elsa Smith, Cherry-Ann Flax, and James W. Georges aka Heru Ankh Ra Semahj; In-Laws –Valentine and John Lewis, Ethel and Isaac Spann, Gerda Frett, James and Adel Frett, Frederick and Helen Frett, Kelvin Frett (All of Tortola) Derek Taylor (Hong Kong); Godmothers — Ms. Evelyn Christopher and Ms. Dorothy Todman (Dots); Special Friend: Elihu Rhymer; Family Friend — Ms. Peronita McDowell; plus many nieces and nephews, numerous godchildren and many friends. The publishers, management and staff of The Island Sun newspaper extend condolences to the family and friends of the late Elton Georges: May he Rest in Eternal Peace.